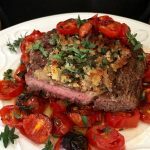 Peppercorn steak or “ Steak au Poivre ” as the French like to call it, is rumored to have originated sometime in the 19th century in Normandy, a region in Northern France. 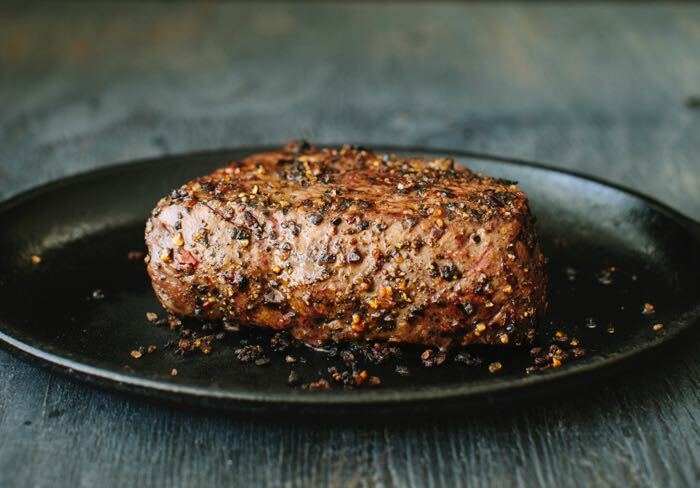 It is simply steak rolled in crushed mixed colors peppercorns, then pan seared to perfection in a cast iron skillet. I used fillets but different cuts like, sirloin or ribeye work just as well. 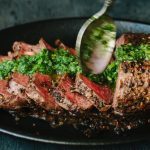 Perfect with just a dab of herbed butter on top, but you can opt to make a quick pan sauce at this point to drizzle over the top. Brandy, cognac or a red wine sauce are popular choices, tough purists might argue a perfect steak needs them not. Pairs well with roasted fingerling potatoes, this leek potato gratin, ricotta mashed potatoes and pommes frites of course (French fries). 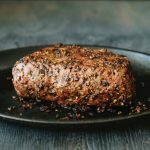 Classic Peppercorn crusted steak or “ Steak au Poivre ”, pan seared in a cast iron skillet and served with a quick wine or cognac pan sauce. Dry your steak well on paper towels and allow them to rest at room temperature for 20 minutes. Crack the peppercorns onto a plate and sprinkle with a good pinch of sea salt. Roll the fillets in the peppercorn salt mix, including the sides. Add the butter to a cast iron skillet over medium flame. Use tongues and add the fillets. Sear until golden brown, about 4 to 5 minutes each side for medium rare.Transfer to a plate and loosely cover with aluminum foil to keep warm while the juices redistribute. Add the red wine, cognac or brandy to the pan with the steak drippings. If using cognac you can carefully ignite it at this time, for about 30 seconds or so then add the stock. Reduce by half then stir in the cream. Continue cooking and reduce for a few more minutes until thickened to your liking. 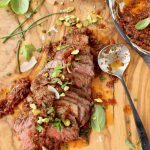 Taste and adjust seasonings with more sea salt and spoon over the steaks.